Custom Wavefront LASIK boosts the quality of your LASIK experience and treatment outcome. This technology supplements the already impressive accuracy of LASIK surgery with in-depth information on the precise shape, structure, and refraction capability of your unique eye. Dr. Sonny Goel offers the benefits of custom Wavefront LASIK at his Annapolis, MD, practice. To learn more about custom Wavefront LASIK and the advantages it can offer you, contact us today. How Does Custom Wavefront LASIK Work? Custom Wavefront LASIK technology provides your doctor with the information needed to make your refractive surgery as accurate and safe as possible by evaluating how your particular eye refracts light. Traditionally, your ophthalmologist determined refraction capability by presenting patients with two corrective issues and asking which one produced a clearer image. While it has its benefits, this method can only narrow the range of potentially helpful corrections. Custom Wavefront technology gives your doctor a far more precise tool with which to pinpoint the actual issue and correct it. Wavefront identifies how your eye refracts light by shining an infrared light into the pupil. The technology measures how the laser is refracted when it passes through your eye and bounces off the retina. Based upon the exact trajectory of the laser’s course, Wavefront can locate and evaluate the severity of aberrations in your visual field. This information is then used to create a blueprint of your eye, which is downloaded directly into the surgical equipment. While your LASIK surgery is performed, the laser itself will draw upon this blueprint to more accurately target and correct any refractive issues you suffer from. Depending on your specific visual concerns, your ophthalmologist may recommend either Wavefront-guided or Wavefront-optimized LASIK, which can correct or prevent higher- and lower-order aberrations. How can Custom Wavefront LASIK Benefit My Surgery? Custom Wavefront LASIK offers a number of advantages over unassisted LASIK technology. Its extreme accuracy results in outlines of the eye that display the specifics of your unique optical fingerprint. This ensures that all patients undergo LASIK surgery that is customized to their particular needs. As a result, patients can enjoy better vision both at night and during the day. This highly controlled degree of precision also minimizes the risk of potential side effects during surgery. 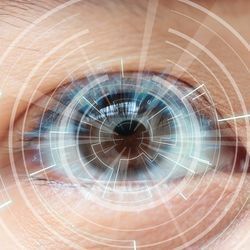 While LASIK is considerably less risky than other types of eye surgery, some patients have reported developing halos or glares after their procedures. Where Wavefront-guided LASIK corrects such issues, Wavefront-optimized technology can prevent them from becoming side effects of the surgery. As a consequence, this method may also significantly decrease or even eliminate the need for glasses or contacts. Dr. Goel understands the decision to undergo LASIK can be difficult. He will take all the time necessary to answer your questions and ensure that the particular benefits of custom Wavefront LASIK technology are suited to your needs. To learn more or to set up a consultation, reach out to us today.